Oh the cravings again. This time it has been for banoffee pie. Nothing weird about that as such, except I have never been a huge fan. I think I may have had it once or twice before, but even for my insatiable sweet tooth it seems a bit much. It would literally be the last thing I would consider when looking at dessert menu. 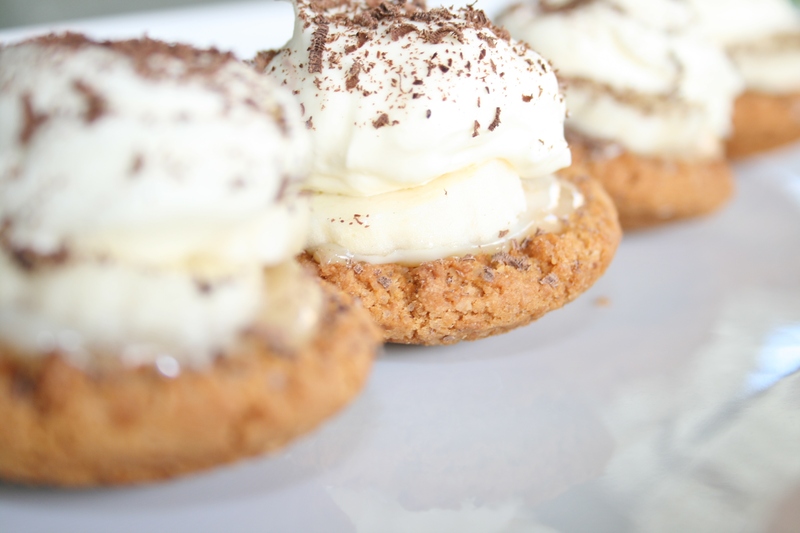 But as I was sitting in front of the TV last week watching MasterChef, one of the dishes in the team challenge they were doing was banoffee pie for the dessert. And since then I have been able to think of little else. I just had to have some banoffee pie!! (On my terms of course). So the recipe below was put together with my own taste in mind, it’s a miniature pie to start with (although I was able to easily put away two at a time). The caramel is not overly sweet nor a huge amount of it, the banana is fresh, the cream has no extra sugar and only a small sprinkling of dark chocolate over the top. As the base I used my new found favourite food invention of using Arnott’s Butternut Snap biscuits for the shell, check out this post for detailed instructions. It really is an easy dessert to make and put together, you can prepare the shells and the caramel before hand and leave in the fridge until dessert time and then just cut up some banana and whip some cream and it’s ready. I made my own caramel which took about 10 minutes of just stirring all the ingredients together over a low heat, but you can cheat this step by buying a can of caramel from the supermarket. That way it will literally take you less than 10 minutes to put the whole dessert together (including the little tartlet shells)! To make the caramel filling: combine all the ingredients in a small saucepan and stir together over low heat. Cook while stirring continuously for about 10 minutes or until the caramel starts thickening. Do not let it boil. 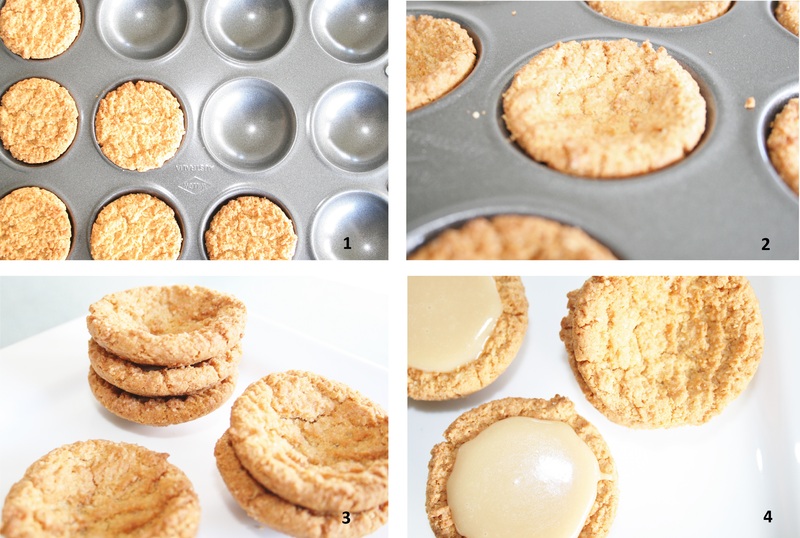 Pour the caramel into the tartlet shells and place in the fridge for 30 minutes or until the caramel has set. (I still had half the caramel left after filling 12 shells, so if you are not making more than 12 pies you can simply half the recipe or I am storing my left over caramel in the fridge for some more treats on the weekend). When you are ready to serve, arrange the sliced banana on the caramel, add a dollop of whipped cream and grate some dark chocolate over each banoffee pie. Serve straight away. The tartlet shells filled with caramel can be stored in an airtight container in the fridge up to 3 days, however once it has the cream on top the pies has to be eaten on the same day. They look great. I tried making banoffee pie without the banana (basically millionaire’s shortbread). But it’s amazing how many people still find that post because they are looking for recipes on google for ‘banana-less banoffee pie’! Thank you 🙂 that is so strange that people would google that…I think that the banana makes the whole thing! In saying that, I had to make a few without banana for my husband and his friend, because neither one eats banana. Thank you 🙂 Hope you enjoy it! Thank you so much 🙂 they are indeed dangerously easy to assemble!! I don’t know if you got my link-back but I made these! They were incredible! Thanks for the recipe! Thanks for trying them! And for linking back to me 🙂 yours looks great!